Fabulous!! What a great happy snowmanboarder! Loving him! You just can’t go wrong with a snowman and he is just perfect! Lovely flow to the artwork bring so much action and life to the illustration, beautiful colours and the swirls of the border really add to the piece. Another great piece by you! You have such a recognizable style – I just love it. Woo hoo! So fun, so great! I love the blue swirly border and red colours. Awesome. wow, love the colors and the action – what a fun illo! Beautiful illustration. Beautiful holiday header for your blog too. Hey Krista! You know I love your snowmen and this guy totally ROCKS! Great work… as usual!! Merry Christmas! and Happy New Year!!! Oooh! Wow! What fun! Wahoo! Fun piece! Happy Holidays, Krista! 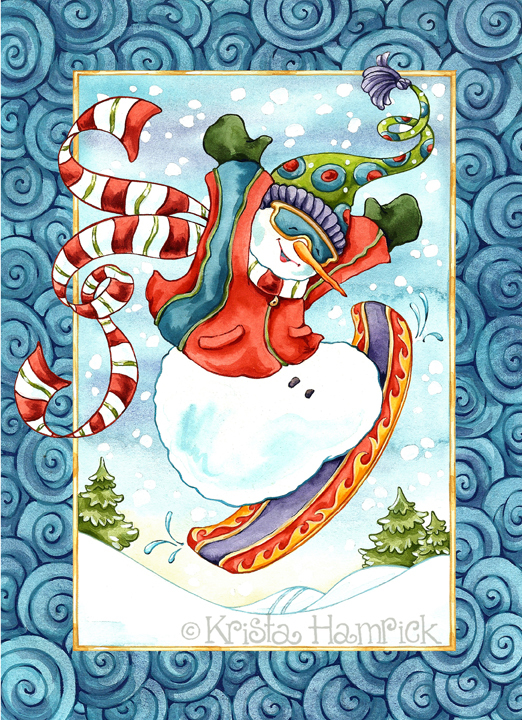 I love the blue whorls in the background and the snowman makes me smile! So happy, and I love the colors! Woo hoo… How fun is that!!! This very happy Snowman does his job of bringing happiness very well.